More power and luxury than ever comes to the Range Rover today (27. 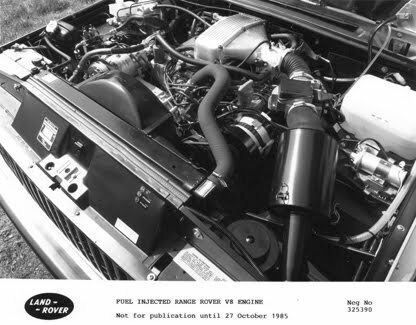 Oct. 1985) with the announcement of an extensive paxkage of refinements - featuring a 165 bhp fuel injected development of the V8 engine. Boosting the Range Rover´s luxury car appeal still further, the latest improvements - which also include a new automatic gearbox - will give added impetus to the product´s current success around the world. Sales this year are at record levels in the UK, major continental markets and Australia - a testimony to the intensive product development that has taken place over the last four years. Electronic fuel injection of the V8 unit gives a 30% power boost to the Range Rover - up from 127 bhp to 165 bhp - while torque is raised to a muscular 206 lbf.ft. at 3200 rpm. Developed using the Lucas ´L´ system the engine combines 100 mph-plus top-end performance with walking pace flexibility, control and response. The fuel-injected unit becomes standard on the very popular top-of-the-line Vogue versions of the Range Rover - which have accounted for more than 80% of UK sales since their launch last year. The proven carburettor engines will be standard on the other models in the line-up, but these have also been significantly improved in terms of efficiency and response. Making the most of the power boost is a new four-speed automatic transmission for Range Rover - the ZF4 HP22 gearbox. It replaces the current Chrysler three-speed unit and features a top gear torque convertor lock-up for improved efficiency. Five-speed manual gearboxes benefit from a entirely new, direct linkage - giving a slicker, smoother gearchange. Matched to the new power is the redesigned, ´roll reduced´ suspension package offering better handling and more controlled body roll. Dual-rate springs and revised damper settings give a more comfortable on-road ride without compromising off-road performance. Top of the range Vogue models also feature purpose designed, all-new high speed Michelin or Avon dual purpose radial tyres for low-noise, high-speed cruising and extreme off-road tenacity. A distinctive front spoiler is also exclusive to the Vogue model. Moulded from damage resistant polyurethane, it incorporates twin quartz-halogen driving lamps. Improved comfort and style has been the hallmark of recent Range Rover improvements. The latest package enhances still further the vehicle´s remarkable qualities. The facia now incorporates central positioning of the radio, a new auxiliary switch panel with "push-push" backlit switches and redesigned, backlit heater controls. The handbrake is cable-operated for greater efficiency - and the lever is repositioned for easier use. A redesigned central cubby box incorporates a cassette rack, rear seat passenger ashtray and cigarette lighter. 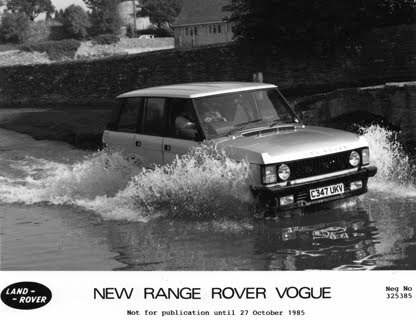 Luxury Vogue models are fitted with safety feature of red warning lights on front doors, and puddle lamps. Stylish and practical side rubbing strips give the Vogue a further touch of distinction. An enlarged range of new exterior colours is introduced, featuring for the first time four tough clear-over-base metallics. "Range Rover´s current success stems from an intensive four-year programme of improvements on every aspect of the vehicle. This has produced a very positive reaction across the full spectrum of customers - at home and abroad, for business or pleasure. But the strongest response has been from people who wanted luxury car levels of comfort and driving refinement to underpin the product's many unique advantages. Our latest Range Rovers continue that process - but perhaps most significantly add a completely new dimention in power and performance at the top end of the range". The latest Range Rovers feature across-the-range improvements as well as developments to specific models. 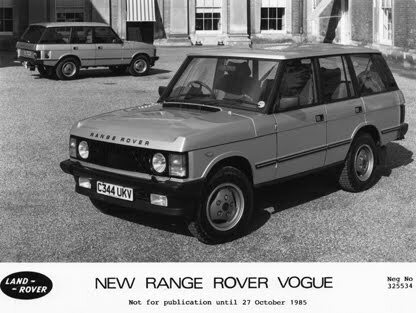 Since the introduction of the Vogue as the top-of-the-line production model last year, more than 80% of UK sales have been of that derivative - indicating how far the Range Rover's luxury car appeal has developed. The latest package offers buyers enhanced performance and even greater comfort with Vogue models featuring a 165 bhp fuel injected engine and a comprehensive range of improvements. Other derivatives - two and four door versions - also benefit from a wide range of interior and exterior refinements while retaining the proven 127 bhp carburettor engine. 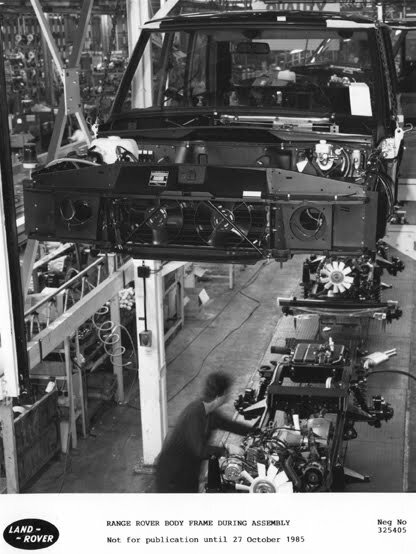 Incorporating the Lucas 'L' electronic fuel injection system, the latest 3528 cc Range Rover engine is similar to that developed by Land Rover Ltd for Austin Rover to use in the high performance Rover Vitesse. Careful tuning of the engine gives 165 bhp at 4750 rpm and a muscular 206 lbf.ft of torque at 3200 rpm - making sure that the Range Rover can take everything in its stride, on and off the road. The unit has fuel injeection into the inlet ports, with pulsed operation of solenoid injectors, and a number of sensors fitted to optimise engine efficiency. An air meter in the intake, together with an engine speed signal from the ignition system, provides the main control. Additional sensors modify the fuelling to take account of coolant temperature, inlet air temperature and trottle movement to provide the optimum air/fuel mix for all conditions. The system is fitted to a cast alloy manifoldnin the centre of the engine's 'Vee' and extra cooling is provided by an eleven-blade fan. Built-in cold start convenience comes with the injection system, as no manual choke is needed. An overrun fuel cut-off is fitted to the V8 engine for the first time. Substantial performance improvements result from this development with 0-60 time reduced by 2.5 seconds on manual versions and top speed up to 107 mph. New high-speed rated radial tyres have been developed to match the on and off-road potential of the injected power unit. Two types are available - Michelin XM+S 200 in 205 x 16 size, or Avon Rangemaster 215/75 x 16. Detailed improvements have also been made to the V8 carburettor engine with benefits to low speed driveability by the adoption of a large bore "pulsed air" injection system. This system draws air through non-return valves into the exhaust ports during the negative pulse of the combustion cycle. The more complete fuel burn resulting from this process cuts emission levels by up to 40%. This has allowed a reduction in the 6 degree engine retard at idle to give much improved throttle response while still meeting appropriate emission legislation. 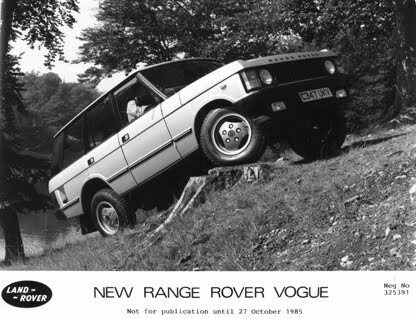 Automatic transmission was first offered on Range Rover in 1982, and has proved increasingly popular - currently being specified by 40% of customers. A major improvement is now introduced with the ZF4 HP22 four-speed gearbox, replacing the Chrysler three-speed unit previously used. Offering four-speed versatility and silky smooth gearchanges, the unit is also used in luxury cars - but an extensive development programme between Land Rover and ZF has adapted the unit to meet Range Rover's unique requirements. A lock-up clutch by-passed the torque convertor in top gear for relaxed cruising while the converter itself is matched to the characteristics of the V8 engine. First gear can be 'locked in' manually for very steep off-road descents while fourth gear is a useful 0.73:1 overdrive. Careful matching of the automatic and manual gearboxes has allowed an improved ratio on the transfer gearbox to 1.192:1 for long-legged cruising ability. Adaptions to the ZF gearbox to meet the dual needs of the Range Rover include a special convertor housing and extension case to the transfer gearbox, while a specially extended gearbox mainshaft connects to the LT230 transfer box. Modifications to the unit to ensure off-road suitability include a special sump and oil pick-up to cope with very steep gradients and side slopes. All breathers are located at a high level to accommodate wading and a gearbox oil cooler is standard fitment. The latest five-speed manual Range Rovers have a much improved gear change with the adoption of a new linkage which now acts directly on the selection shaft to give a slicker, smoother action. This has allowed the new, shortened, gear lever to be moved towards the driver in a 'ready-to-hand' position. All models continue to use Land Rover's two-speed LT230 transfer box for permanent four wheel drive grip. This unit, which incorporates a lockable centre differential, provides eight automatic and ten manual forward ratios. While Range Rover is already acknowledged to have luxury car ride comfort, Land Rover Ltd's engineers have reduced Range Rover's body roll with the latest series of suspension developments. Single rate rear coil springs have been replaced by dual rate units which - together with larger front radius arm bushes - increase roll stiffness. Damper settings have been adjusted to suit the new set-up and ensure that Range Rover retains its standard-setting combination of on-road comfort and long travel off-road articulation. 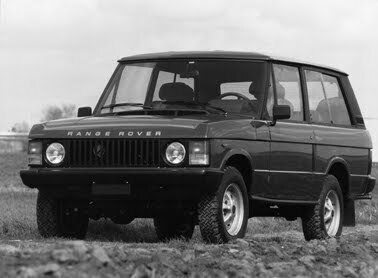 Intensive product action since the launch of the four-door version in 1981 has brought a progressively more refined Range Rover. The launch of the Vogue version last year - with over 400 changes - was a most significant step forward, but the latest series of improvements will project the vehicle's appeal even further up market. Inside the vehicle, these developments include a centrally located radio - moved from the driver's side - revised and illuminated switchgear for heater and air conditioning controls, and a handy panel of up to six push-push auxiliary switches for minor controls. The new ZF gearbox has allowed a new slimline transmission tunnel to be developed for more front seat legroom. Fitted to the slimline tunnel is a redesigned cubby box incorporating a built-in cassette rack and rear seat ashtray and cigar lighter. Controls for the fast-acting electric windows are repositioned on the front face of the cubby box for greater convenience. Outside, new high efficiency headlamps provide increased light output, and the windscreen wash is improved by the introduction of a four-outlet system. Colour co-ordinated comfort comes with Vogue models available in Silver Grey or new Bracken interior trim - keyed to body colour. Two and four-door models are finished in Bronze check. Subtle changes to the exterior styling enhance the Range Rover's already classic looks. A tough moulded polyurethane front spoiler is fitted to Vogue models. Distinctive and practical, the spoiler is fitted with twin quartz halogen driving lamps. The Vogue also has side rubbing strips - incorporating a silver feature line - to guard against parking bay scrapes while on all models new bumper end caps now wrap round all body corners to protect against day to day knocks. Paint finishes on the latest Range Rovers are significantly better than at any time in its history. Vehicles are now painted with 'state of the art' cathodic electro coat priming, giving a tough, durable, high quality finish. Clear over base matallic finishes are also available for the first time. With the new system comes a wider range of colours incorporating the best of the traditional tones and a selection of bright new colours. Metallic finish is available in Astral Silver, Caspian Blue, Cyprus Green and Savannah Beige.